The Blue-throated Macaw is a rare treat to behold, being one of the rarest birds in the world! The Blue Throated Macaw Ara glaucogularis is one of the most spectacular of the large Macaws. It displays an elegant form and is more graceful in its movements than its counterparts. In color it is similar to the slightly larger Blue and Gold Macaw, with a beautiful teal blue color along its upper parts and a golden color underneath. But it is distinguished by a large blue band across the throat that extends up to its ear coverts, and thus the name 'Blue-throated'. It is also known as the Canide Macaw and the Wagler's Macaw. This beauty has only really become known in aviculture since the late 1970's. While all the other large macaws were discovered up to 200 years earlier, in the 1700 and 1800 hundreds, the Blue-throated Macaw was not described until 1921. Its natural habitat is not widespread. It is found only in very reduced areas, primarily in Bolivia. They dwell mostly in lowlands inhabiting humid dense forests, or secondary forests close to water. The Blue-throated Macaw is a very docile and affectionate pet bird, but it is also quite intelligent and inquisitive. As wild birds, they are found to be shy and reclusive, but as hand-fed birds they are very outgoing and talkative. They love chewing and performing acrobatic antics. Those activities, along with exploring their surroundings with their tongue and beak, are some of their favorite pastimes. Although these Macaws don't care to be handled quite as much as their close relative the Blue and Gold Macaw, they are undemanding and friendly. They are not inclined to bite nor are they not excessively loud, as many of the other macaws can be. The Blue Throated Macaw is quite content to entertain itself especially if given plenty of chewing materials. These qualities make them a wonderful pet or aviary bird. They can be kept even where there are neighbors close by. Current taxonomy identifies the Blue-throated Macaw as its own species. However it has been a species of question. The Blue-throated Macaw is very similar to the Blue and Gold Macaw Ara ararauna. Author Joseph M. Forshaw in his atlas, "Parrots of the World", mentions that this Macaw could be a subspecies of the Blue and Gold, Ara ararauna caninde. It is slightly smaller however, and is found only in the southern population of the Blue and Gold's region, and in a very restricted area. Other slight distinctions between the two are a less extensive bare facial area on the Blue-throated with the black tracings on the cheeks being more blue and are somewhat broader, and the blue band on its throat extends up to the ear coverts. Distribution The Blue-throated Macaw Ara glaucogularis, previously Ara caninde, was first described by Dabbene in 1921. Like Red-fronted Macaws, the Blue-throated Macaws are also found in a very small geographic region. Their range is quite limited, and today it is found primarily in the Llanos de Mojos (Moxos) region of northern Bolivia. This area is is north-east of the Andes, mostly east of the Beni River, and is the southern most extension of the Amazon.They were early described as being from the Buena Vista district of Bolivia, Paraguay, and Northern Argentina in the province of Chaco. The preferred habitat the Blue-throated Macaws are lowlands of humid dense forests, or more open secondary lowland forests, usually close to water. Like the Blue and Gold they feed on seeds, nuts, fruits, and possibly some vegetable and protein matter. Status The Ara glaucogularis is on the IUCN Red List for Endangered Species as Critically Endangered (CR). The natural habitat of this Macaw is in a very restricted region, so when it was first discovered there were probably around a couple thousand birds. In the early 1980's, when it first appeared in aviculture, it was then trapped extensively. An estimated 1200 birds exported. Trapping has since been greatly reduced, but the population is still greatly reduced. The IUCN Red List report suggests about 250 mature individuals, but recent surveys indicate that the natural populations may be increasing slowly. Description The Blue-throated Macaw was first thought of as a subspecies, or a juvenile, of the Blue and Gold Macaw. They are similar in color to the Blue and Gold Macaw with upper parts being all blue and under parts being an orange-yellow. The blue coloring of the Blue-throated Macaw is a bit more aqua toned than the Blue and Gold Macaw, having a greenish tinge, They also have a blue band across the throat, thus the name 'Blue-throated'. Their bare facial patch is also a bit smaller than the Blue and Gold's. It is also lined with blue feathers rather than the black feathers seen on a Blue and Gold Macaw's facial patch. The tail is long and tapered and the legs are gray. The beak is a gray-black and the eye is yellow. The Blue-throated Macaw is a full sized macaw, though they are a bit smaller than Blue and Gold Macaw. These birds are about 33 inches (85 cm) in length. A younger bird will be similar to the adults but have a shorter tail and dark brown eyes. Care and FeedingIn the wild, like their larger cousin the Blue and Gold, Blue-throated's most likely eat a variety of seeds, nuts, fruits and probably some protein. There are name brand commercially prepared seed or pellet mixes for the Macaw. They can also eat anything nutritious that you eat and these foods should be offered. Most parrots enjoy eating with their family. They eat protein in the wild and they do like chicken. Avocado and chocolate are toxic to parrots. They require bathing to keep their feathers from drying out. They are used to a humid climate and without bathing their feathers will dry out and become itchy causing them to chew on them. You can spray them down with room temperature tap water or a commercial bird bath. 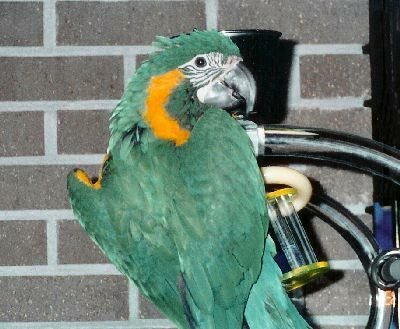 Many owners just take their Macaw into the shower with them. They make shower perches for Macaws. HousingA roomy cage is required, at least 2 1/2 by 3 feet. A large sturdy perch needs to be mounted in the cage. Many birds can spend most of their time on a play pen or parrot perch. The Blue-throated Macaw is an avid chewer and should be provided with plenty of natural branches and wooden toys. Fresh fruit tree branches work great for them to chew on, but then they will have to be replaced occasionally. Food and water dishes, along with a treat dish work best mounted above the perch at the side of the cage. As alternatives to a cage, they can be kept in an outdoor aviary where the weather permits, and some people like to provide their bird with its own "bird room". These pet Macaws need at least 2 - 3 hours a day outside their cage. Many birds can spend most of their time on a playpen or parrot perch. A Macaw's cage is their territory and a play pen top is great, but it is still their territory. It is better to interact with your Macaw on top of a sturdy perch away from the Macaw cage. A separate, free-standing playpen works great for this. Social BehaviorsIn the wild the Blue-throated Macaws are very social birds, often seen in the company of Blue and Gold Macaws. In captivity, these birds are mellow, friendly, and inquisitive. They enjoy interaction with people as well as other birds. They rarely ever bite, though they do explore their surroundings with their tongue and beak. They are happy to entertain themselves as well; playing in their cage, talking to themselves, and chewing on toys. They can be a good family type bird. They are a gentle bird that will get along with more than one person, although they will probably have a preference in the family. But they are a typical Macaw and can be cranky at times and may prefer only one person or only one gender. To have a well-rounded bird that enjoys more than one person, make sure it is well socialized with lots of folks. Handling/Training The Blue-throated Macaw adapts quickly. Once it becomes accustomed to a new environment and its keeper it is then ready to start bird training. Generally though, you should give a new arrival a few days to get use to you, your voice and its cage before trying to handle it. A hand fed baby will not need much taming and can often be handled right away, as it is use to human attention. With all parrots, taming and training takes trust and patience. Macaws are very intelligent making them easy to tame. They are also very adept at learning and quick to train. They excel best at learning tricks and small tasks. They are not as inclined to talk and mimic as some of the other parrots, notably the Amazon Parrots, but they can learn a few words or phrases. ActivitiesFor the physical well being and psychological health of a Macaw Parrot, they must have plenty of opportunity to exercise and play. These are lovable pets and activities include interactive time with its keeper. Everything from petting, cuddling, and preening is appreciated, as well as performing and learning new tricks. But these are also very large, rambunctious pets that need a good sized space to play and climb around. Both climbing around inside a large cage, and providing a outside playpen offers them interest and variety. Providing regular interaction and lots of playtime. Having plenty of space and a large selection of toys and activities will help deter distress in your pet Macaw. It will also reduce the chance of your parrot developing undesirable behaviors like screeching, biting, and feather picking. Sexing - Sexual DifferencesNo visible differences. There is no for certain way to distinguish a male Blue-throated Macaw from a female. In order to know whether you have a male or female, the bird must be sexed. DNA / Feather or surgical sexing is recommended. Breeding/ReproductionIn the wild the Blue-throated Macaw will build its nest in palm trees. They were first bred in captivity in 1984 and are found to be ready breeders, though the babies are a bit difficult to hand feed, especially when very young. The usual clutch consists of two to four eggs which incubate for about 26 days. The babies will fledge after about 3 months in the nest. Feed the parents additional high-fat seeds, like sunflower seed, during the breeding season. The young will also require a high-fat diet as well as additional protein. We have no reports of the Blue-throated Macaw being crossed with other large Macaw species to develop hybrid Macaws, nor with any of Mini Macaw species. Potential Problems It is definitely true that a Macaw parrot can make noise, but it is not often, and not without some provocation. Fortunately the Blue-throated Macaw is not as noisy as most of the other large Macaws. Usually if a Macaw makes a loud squawking noise, it's because they perceive something to be wrong or different. Maybe a car they don't recognize is coming to the home or the dog is loose. They are also known to make a noise for about 10 minutes as the sun is setting. This is an alert to their flock to settle in for the evening. If you notice any of these bird illnesses in your Blue-throated Macaw immediately provide a warm, draft free, secure environment kept at about 86°F (30°C). Place food and water close to the perch where it is easily accessible. An ailing parrot should be taken to an avian veterinarian for diagnosis and treatment. Availability: Blue-throated macaws are not common in captivity. They are however being successfully bred and are available as a pet, though they are still quite rare and expensive. I don't know how many see this site, but I just wanted to share a story about Tika, my BTM. She accidentally got loose and went missing. She was just a baby and had not yet mastered flight. The wind was blowing hard and she could not figure out how to descend. When she flew out of sight my heart broke. Since she is a critically endangered species, the local newspaper and news channel spread her story to the community. We searched endlessly for her and the out pouring of friends, family, and community support was heart warming. After five days, our hope of recovering her turned into relentless grief. But then, a miracle happened. a stranger was watching his grandchildren play outside when he heard Tika screaming overhead. He looked up and spotted Tika who was being chased by two large hawks. Tika took refuge in a small oak tree nearby. He spoke softly and called to her, enticing her with an apple he had been eating. Out of desperation, she landed on his shoulder and began ravenously consuming the apple. He took her inside and called our number, and we were reunited!!! It seemed like a miracle! Tika was so weak she could barely stand, but she recovered fully. In tracking her travels (our sightings and others) we figured she went approximately 40 miles. NOW FOR THE REST OF THE STORY... our breeder put us in touch with Dave & Jaime Womach, professional bird trainers. They encouraged us not to clip Tika's wings, but to teach her recall flight training instead. We wanted Tika to enjoy being a bird and to be healthy and happy physically and mentally. We were hopeful and terrified at the same time, but we signed up for the expeience. We worked with Tika daily, increasing our bond tremendously. This October (2009) we joined the Womachs and others in Moab, Utah, and we free flighted our birds. It was beautiful, amazing, and our hearts were filled with joy to watch these magnificent creatures fly across canyons, play in the wind, and be free. Mind you, this is only something I would recommend under the strict guidelines of a trained professional, but our experience could not have been better. Tika now free flights with us in our home state of California (being very mindful to take all safety precautions of course). But, I really wanted to share this story because it is not just a story about Tika, but a special testimant of how amazing the BTM's and really, all parrots species in general can truly be. I was wondering if you know any BT breeders in California ? Hello, I am looking to buy a blue throated macaw. Please email me at kimjacomo@verizon.net. I'm looking for Blue throated macaw as well. Chicago, California, New Jersey, Florida, and Texas all have legal breeders. I'm trying to find one in PA or the rules to be a conservation breeder here in PA. Best of luck! I am looking for a local breeder of the miligold macaw speices in the range of san diego to san bernidino.